Create a superior store with Shopify's shopping cart. Benefit from an online shopping cart that has every feature you need. 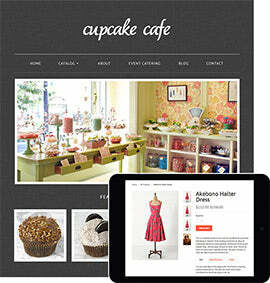 Choose from over 100 free and premium website templates for your online store. Shopify partners with designers known 'round the world including Clearleft, Pixel Union and Happy Cog, offering our customers the best of the best. At Shopify, we make it easy for you to build the perfect online image. Each theme comes with settings that let you tweak & alter your site any way you please and then preview it right away using our new Theme Settings Editor. Use Liquid, Shopify's templating language, to edit every aspect of your storefront. Use HTML, CSS – whatever code you're comfortable with to take complete control over your website's design. To gain an understanding of the capabilities on Shopify, have a look at what some of our customers have done to personalize their online stores. If you're looking for something totally custom, consider collaborating with a Shopify Expert. 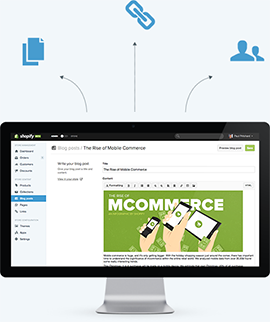 Looking for a more hassle-free, full-service ecommerce solution for your clients' websites? Shopify's zero design constraints, robust admin area and advanced hosting services make it a great choice for designers and developers around the world. Build your vision using one of our templates and transform it into a fully-featured ecommerce store in no time. Running an online business is easy with the right tools. Shopify's advanced online shopping cart system provides you with everything you need to start processing credit cards and fulfilling orders on your website. All you have to do is choose a theme, add your products and leave the rest to us. You could very well make your first sale as early as today! To make sure your ecommerce store is equipped with useful, customer-friendly features, we offer a wide selection of apps that are easy to install. Just a single Shopify app can enhance your SEO, improve your management capabilities, increase the effectiveness of your marketing efforts or help you monitor critical trends and statistics. Shopify's admin lets you discover insightful information about who your customers are and how they shop on your website. In a single glance you can see their details, order history & shopping habits. Your customers can create personal accounts upon checkout, making future purchases faster and more convenient. Organize your customers into groups through your admin area according to order history, location and more. Manage your content, images and page navigation all from your very own dedicated Content Management System. Simply log in online and gain complete control over your online store through our feature-rich, easy to use CMS. Connect with your customers regularly through a fully functioning blog system that comes with every Shopify plan. Now you can maintain a consistent voice with your target market through articles, infographics, videos, lookbooks and more. Safe and secure purchases with Shopify's shopping cart. We integrate with over 70 gateways to make it easy for you to use an existing one or choose from our list. To find out if we support your current gateway, or to browse through the options available, click here. Give your customers the peace of mind they deserve with a secure and easy-to-follow checkout process. Shopify's shopping cart system has it all. Benefit from the same high level encryption used by major banks with your 128-bit SSL certificate. We include it in your package at no additional cost so your information is always secure. You don't need to worry about country and state tax rates because once you choose your preferred local currencies, we handle the calculations for you. 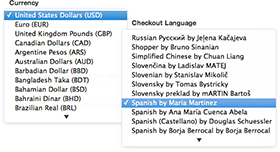 Plus, our online shopping cart system comes equipped with 50+ languages to suit the diverse needs of your store. Set up your shipping rates to reflect the nature of your website. Opt for fixed-price, location-based, tiered or weight-based. Sign up for Shopify's Business or Unlimited plan to receive automatically calculated shipping rates from major global carriers including FedEx, UPS and USPS. Your online shopping cart can safely and securely accept credit cards thanks to Shopify's Level 1 PCI DSS compliancy certification. Your customers can shop with complete convenience and simplicity. Bring on the traffic! As your visitor numbers spike, you don't incur any additional costs. Shopify employs a number of different measures to ensure that your ecommerce store is always up live and online. Once you're signed up, your website is created in our system within seconds and we provide instantaneous upgrades. Shopify is Level 1 PCI DSS compliant meaning your customer data is always secure. Right through Shopify, you can choose and register a custom domain name for your website. You have the flexibility to use an existing domain, buy a new one or take advantage of your free .myshopify.com domain. Shopify uses a global server network that ensures fast access on a worldwide scale. Start marketing to your target audience. Today, if customers can't find you online you're missing out on a ton of potential business. And this is why Shopify is designed to encourage & support SEO practices including title & meta tag customization. Every time you add a new product or make a change to your website, you want to be sure your updates are reflected in the search engines. 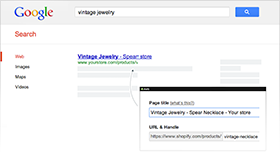 Shopify automatically generates sitemap.xml files to notify the search engines of your edits. Looking for ways to increase sales and promote your products to customers? When you're a Professional, Business or Unlimited plan holder you are free to use Shopify's coupon and discount codes. Offer your customers coupons that allow them to save by dollar amount, by shipping costs or by percentage. Integrate your Shopify theme with all the major social networking sites and let your customers do a little selling on your behalf. Online visitors can easily share products and pages in your online store with all the people in their network. 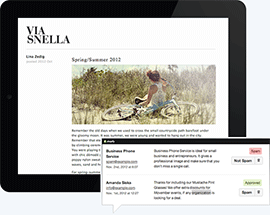 Encourage your customers to sign up for emails through your website. Shopify has partnered with Google and Facebook to help you give your business a kick-start in the beginning stages. Receive $100 in free advertising on Google Adwords when you spend just $25 and as a brand new merchant on Shopify, you automatically get a $50 credit on Facebook. Detailed reports on your store. Shopify's system comes with built-in analytics that give you tremendous insight into your business's performance. Monitor your sales, track your traffic and analyze customer purchase trends to enable sound decision making for your business in the future. The support you need – around the clock. Shopify holds itself accountable to the highest standard in customer service and we do this through ongoing measurements of your happiness. After each interaction you have with our support team, we ask you to rate your experience. These ratings are posted live for all to see — needless to say, we take them pretty seriously. Visit the Shopify Help Center to view step-by-step answers to the most commonly asked questions. From our templating language, Liquid, right through to APIs for app development, Shopify provides detailed, instructional documentation. Rich with diagrams and illustrations, these documents are easy to follow so you can code efficiently, without wasting time learning beforehand. Talk about anything and everything in our community discussion forums. Ask fellow Shopify users how to choose the best website template, select a payment gateway, design a marketing strategy or set up SEO for your online store. We're here to help you manage all aspects of your ecommerce business. Read through our informative and easy-to-follow tutorials and guidebooks to get immediate answers to your questions or to learn how to make updates. Get your store into the mobile market. Your Shopify website automatically comes with a free mobile commerce shopping cart that is built into your online store. Now your customers can buy your products securely no matter where they are. Shopify makes sure your site looks just as good on a mobile as it does on a laptop or desktop computer. You can browse through Shopify's Theme Store to find the perfect free or premium mobile theme to complete your online store's image. Directly from your iOS device, you can view order histories, monitor sales, see customer data and so much more. 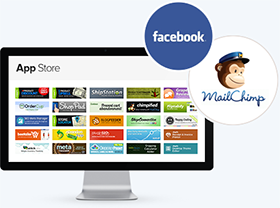 Now it's easy for you to manage your online store anywhere, anytime.